Well hello spring. The change of season always fascinates me and always encourages a sense of new beginnings, positivity, hope and happiness. I hope you are all feeling the same. I wanted to share with you part of an email I received from one of our fabulous clients which filled my day with joy, she wrote the following 'you and the team have really changed my life and given me the freedom to be me again'. Whenever I receive the countless emails and letters from our amazing clients it never fails to overwhelm me and the Lucinda Ellery team, your words mean so much to us and they help us continue to provide the LE experience to you all. Thank you from the bottom of our hearts, it really means so much. To all our wonderful, magnificent clients and to the girls I work with and on, I thank you for the joy each and every one of you brings to my life. I would like to put out a special thanks to the wonderful support team I have in Priya (ops manager), Marina (regional studio manager), Miriam (senior advisor), Sandy (finance manager), all of our maintenance, housekeeping and admin team; the wonderful smiles each and every one of you bring to me every day I thank you for, I am beyond appreciative. I as usual, have spent a number of weeks in LA of late and I must say the LA team is settling into a lovely core team. A core team is an amazing thing to witness develop and grow, the team work in such good flow together so much so that when a new member joins the process almost becomes self regulating. It is the team we are all part of that help our newest members and ensure we all operate in loving sync. LA has achieved this wonderful unique balance between colleagues, creating a joyous atmosphere, this comes over to me loud and clear even in London all the time. But this lovely feeling which transpires from across the pond of a team building a sanctuary for our sisters across the water even touches some of our London clients who stop by when on business or vacation who tell me the exact same thing, that they too get the same Lucinda Ellery feeling whether in LA or London. This success is a huge testament to my darling Micky and it is under her firm but fair hand that LA has transformed in to a strong, agreeable, sequence strewn, palm lined, amazing space. Micky has created, along with the team, a feeling of camaraderie with the team and clients alike and the studio is fast becoming one of my most favourite places to be. I often think that the testimony to ones success is how we cope with challenges in our lives, often sweeping along with some anxiety; to be able to keep that at a minimum and to keep everyone enjoying the experience takes a steady, gifted hand and this is truly what Micky has demonstrated. My lovely son-in-law, Jean- Francois, is currently working on filling a gap in TTM research in the States and will be helping me, alongside Professor John Grant, who has kindly agreed to look at some work I am putting together on TTM and the true facts. Thank you Professor John Grant for your efforts in helping us on this project, the results of which I will be sure to let you all know. I am so excited to be visiting Manchester later this month where I will be seeing the amazing team as well as the fabulous clients. I always enjoy visiting the Manchester studio who, under the strong guidance of Domonique and Tom, has grown and developed into another joyous space for us to gather and I have missed going there; and due to the focus and development of our newest Bristol location and now NYC there hasn't been much time until now so I am so looking forward to seeing you all in Manchester. 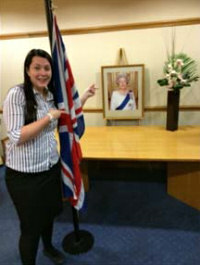 Also a HUUUGE congratulations to Manchester Studio Manager Domonique Diamond who, after many tests and jumping through hoops, got her British Citizenship. Well done Domonique, you can see in the picture how happy she was at her ceremony. Our two newest studios Bristol and NYC are coming along nicely. Recently Chris and I met Micky in NYC. In 3 days we viewed 35 building sites to find our NYC location; we have now started negotiation on a studio I am in love with. A great place which is right near a subway station in Manhattan, however due to the never ending story of permits it will still be a few months until we are fully up and running, we will keep you informed if we ever get the go ahead. On my return, as I had taken a few days out of the business to recuperate, I took myself down to Bristol to see how the team is getting on. There is something about Bristol; the energy, the team and the city itself always make my visits so delightful. The team are so enchanting with such a nice way about them and I look forward to visiting them again this summer before heading back to the States. With all this travel comes time for me to sit and reflect whilst en route, during this time I usually listen to 'The Power' or spend the time reading the most inspiring book called 'E2' by Pam Grant. Should you be looking to raise your vibration and ultimately your frequency then I strongly advise these as aids. I am still spreading the word to our clients about the profound effect watching 'The Secret' has had on my life and the lives of others around me. If you haven't yet watched it please do. These aids help us take control and command of our own emotional response to what life is dishing out. It is a huge benefit to explore the world of our thought, its energy and purpose. By exploring these arenas, there is no doubt, from personal experience, that once we learn that our thoughts are energy, that we have so much more say in the experience of our own lives. I am a believer that if we recognise and practice the process of thought and what it can attract to you the possibilities are endless. This recognition is within each and every one of us and switching it on shows us all that we have the power to achieve health, wealth and happiness in our own lives, all it takes is a little seeking and a bit of dedication in those spare moments. I listen to 'The Power' when I am doing a food shop in Sainsbury's or when I travel. 'Ask and it is given' is yet another wonderful CD to listen to and well worth giving a go. These things are aimed at bringing love and balance to support us through our challenges and by changing the way we respond to the world, we begin to feel so different that we often even look it. Anyone who wants to explore these concepts with me feel free to book in for a short 1-2-1 with me and I would be happy to get you going. 2015 is an auspicious year, I believe there are big energetic changes and a raising of consciousness globally and while there is much doom and gloom in areas on the planet I feel it is up to the individual and when one can't do anything on a global scale, to start at the very least on ourselves. Starting with ourselves will help create a better life for us which we can then use to help others do the same. We all have ability to contribute to others and by doing so we can help create happiness on a wider scale. Thank you so much every one for gracing us with your presence in our lives and as always we aim to keep our standards as high as is humanly possible. I wish you all the best start to the summer and remember I am always around should you ever wish to see me. I have always had fine hair and I had resigned myself to the fact that I was just unlucky; telling myself, convincing myself that at least I didn't have a life threatening disease and I shouldn't be so vain. However, underneath I felt like I was slowly dying. I was terribly unhappy and felt like a monster. You see, from the age of about 15 my hair was gradually getting thinner and thinner, it was so embarrassing. No one understood what I was going through, and nobody understood why. I must have seen up to about 10 different doctors, specialists and I had so many different opinions given to me; I even had injections of high dosage vitamins which every doctor told me I was lacking, and the results were always the same ...nothing worked. Of course, everyone put it down to stress. I got by using hair pieces and massive bows, kidding myself that I looked fine but what other solution was there? I had tried wigs but that was out of the question for me, I always thought they looked false and I couldn't bear the thought of taking a wig off at night time. It was completely by chance when I saw a magazine one day of a story about a woman who had the same problem as me but as I looked at her photo I couldn't believe how beautiful her hair was, I remember thinking "how is that possible?" I then continued to read and nearly burst into tears when I realized that her life had completely changed when she had found The Lucinda Ellery Hair Consultancy. Obviously, like everyone, I wondered if I could afford it but after one visit to the salon, the lovely warm welcome and the understanding displayed by Lucinda herself and her team I knew I had to have the Intralace System. What can I say? The rest is history. I had the Intralace System fitted seven years ago and haven't looked back since; for the first time in my life I felt a complete woman. Hair, as my mother always told me, is a women's crowning glory and I know only too well now how true that saying is. The expertise in the salon and finding the right colour to suit you is simply first class, the staff are just absolutely adorable they make you feel really special, making sure you are feeling comfortable and most importantly not intimidating. How terrible it used to be going to a normal hairdresser and the insensitive comments that they would say like "what illness do you have?" it was awful. I love going to Lucinda Ellery now because I feel relaxed, normal, human and beautiful. From the people that work on reception to the managers, the wonderful girls who make it happen with the system, the stylists ...everyone is just lovely. Even after you leave the salon, (looking like a million dollars), if you have any other questions or worries the fantastic, caring Miriam is only a phone call or an email away with great advice and a friendly warm voice to help. At the age of 38 I finally got the life I only ever dreamed of having. I'm not a rich person, I'm a single mum and I work but I organize my life and budget around my hair because it's not just my hair it's my lifeline. Thank you Lucinda Ellery and to all your wonderful team (especially Miriam). I have been working at Lucinda Ellery for 11 years now and my primary role here is to be the first point of contact for ladies that are enquiring about our services. We receive several enquiries on a daily basis from ladies of all ages, from all different walks of life all trying to manage a problem with their hair. It is great to have the opportunity to explain that we can help as we have different options for different hair scenarios. Each call is individual but many ladies will have similar questions. I am going to answer some frequently asked questions for you….. hope it helps. HOW DO I KNOW WHICH LUCINDA ELLERY OPTION IS BEST FOR ME? We can often determine which of our techniques is the most suitable when we have that first chat over the phone, however when we get the opportunity to see your hair at the consultation, we can be very specific about wh ich of our options would be best suited to you and we can then explain everything in detail. WHAT ARE THE DIFFERENCE BETWEEN THE INTRALACE SYSTEMS AND A WIG? The Intralace systems are designed to be worn 24/7 and they do not need to be removed before sleeping. You wash, brush and care for it like it was your own hair. You can swim and take part in everyday activities that are often not possible when using a wig. Many clients will have already tried wigs before they contact us an d will say that they find wigs hot and uncomfortable and also they hate the fact that they have to take it off or that it can come off. The Intralace options are created using a hypoallergenic material mesh which allows the scalp to breathe and are designed to be worn all day and all night. I HAVE BEEN TOLD THAT MY HAIR LOSS IS TEMPORARY; WILL THE INTRALACE SYSTEM INHIBIT ANY REGROWTH? We have lots of ladies that choose to use our services whilst managing a temporary type of hair loss and the Intralace System will not prevent your own natural hair from growing. We have increasing amount of ladies that use the Intralace System whilst undergoing chemotherapy. These ladies will use the system to conceal their hair loss during their chemotherapy treatment and the system is then removed when the client's own hair has reached a length that they are confident with. Many women report that hair loss is the side affect they most fear about being diagnosed with cancer and are relieved to find that they can use the Intralace System successfully during their treatment. MY HAIR IS VERY FINE, I DON'T HAVE ANY PATCHES OR ANY AREAS WHERE YOU CAN SEE MY SCALP BUT I WOULD LIKE MORE VOLUME. CAN YOU HELP? Our Medi Connections are ultra fine lightweight real hair extensions and are perfect for adding volume to fine hair. They are placed underneath your own hair to add volume. At the consultation we will confirm how many you need and discuss len gth and colour. Like our Intralace options, we use real hair and so looking after your new hair is easy. I AM WORRIED WHAT EVERY ONE IS GOING TO SAY ABOUT MY NEW HAIR, HOW DO I MANAGE THIS? Wow. I have been overwhelmed by the support and generosity shown to me during this crazy ride called pregnancy. I'd just like to say thank you to my team both here in Edinburgh, for your support and for carrying me through each and every day and to the team in London on the end of the phone whenever I need an ear or just for someone to cheer me up. Thank you for the amazing baby showers I was thrown in both locations, you guys have made this such a special time for me and have really spoilt me. A special thank you to my baby's GLAMMOTHER aka Lucinda, Chris and Dax for your ongoing support. And finally to all my absolutely amazing clients; you have shown me such love and encouragement throughout this time, you have all given such good advice and tips and I just love hearing all of your own pregnancy stories. Thank you for the most beautiful gifts you have given me and this little soon to be born lady. Both Neil (my partner) and I have been truly blown away by all we have received from you, this is one kitted out little girl already and she hasn't even made an appearance yet. As you can see from the photograph, since Robyn wrote her letter she's given birth to a lovely baby girl, Summer-Lea. For those of you who read my last article, I talked about the importance of awareness and reflection because I thought it would be great to learn how to use a couple of simple techniques which with lots of practice, can make a real difference towards how you feel in all kinds of situat ions, and life in general. So with these qualities in mind, I'd like you to keep them quietly floating away in the background as you read. We're going to think about hair, one of my favourite subjects, and probably one of yours. As a Trichster, I'm totally obsessed with hair. For as long as I can remember, I have always noticed hair, especially long amazingly groomed hair. I'd be in awe of it, love it and badly want it, and for 30 odd years I'd go round in circles wondering why I just couldn't stop pulling mine. Next take a look at the image alongside. Pictures can help us to connect with how we feel about things. As soon as I saw it I thought, wow, I love it - that'll be great for the article. Why? Because the image plus the caption made me feel good about myself. And then I started to think, why do I love it? It's because I've learned to love the problem. Let's take Trich for a moment – in order to love yourself, you have to love (and sometimes this can mean learning to love) the bits about yourself that you don't like very much - in this case Trich. If we don't learn to love the problem it can leave us with a feeling of not liking ourselves, or at least a part of ourselves, which isn't a good feeling is it? Here's an example. I might say 'oh I don't like my job', now as I see it, it's not the job itself that's the problem, it's my relationship to the job and how I think about it that's the problem. So if I can learn to love the problem ie, my relationship to the job, and if I can grab hold of that, and wonder why that is, I will start to feel differently about it. That's the awareness thing kicking in. And once you're aware of something that you didn't know before, the learning process begins and that's not always easy or pleasant, because we might discover something that we didn't want to know or admit to. 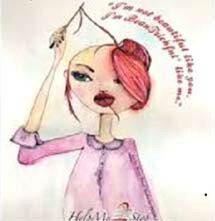 But what this does is give us the control back and the choice to do something about whatever it is we have discovered. And so you see by loving the problem means you get curious not cross, which in turn helps you to feel more inclined to do something about it. Does that make sense? It's exactly the same with Trich. I'm often asked, 'how did you stop pulling? ', 'how did you do that?' Well I've thought about that, and still do because I finally realised and accepted 4 years ago, that it's part of me, always will be, but the thing that has changed is my relationship to it. I feel in control whereas before it felt bigger than me and I felt out of control and helpless. So learning to love the problem is what eventually helped me to stop pulling. Now what do you think when you look at the image and read the words? Give yourself permission to think or feel anything you want. I hope you think you are beautiful when you think of yourself, because you are, or can learn to be and now is no better time to start. If you find yourself struggling or getting stuck, I'd love to hear from you. Until next time, get loving those problems. As you may have read last month, Nicole has been promoted to our management team. Nicole who brings years of colour and style training to us, as well as her positive attitude, is now our current salon manager. She has firsthand experience with alopecia which allows her to have a special connection with many of our clients here. There is no problem too big for Nicole and she is always able to overcome our client's hair challenges in a sensitive and loving manner. 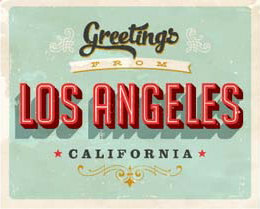 Our team were pleased and excited to welcome Manchester Studio Manager Domonique to Lucinda Ellery Los Angeles. Domonique was such a delight to work with and the LA team enjoyed chatting with her about all of her "overseas adventures". Domonique spent the entire week honing each employee's techniques with her expertise. The team commented how nice and interesting it was to learn different "tricks of the trade" from one of most experienced stylists within the Lucinda Ellery family. There were plenty of fun stories exchanged about life in Manchester and in Los Angeles. One of the highlights of Domonique's "Hollywood Experience" was trying her first 'In N Out' Burger and going to Malibu to see the ocean. The week ended far too quickly and our Los Angeles team is very excited to work with Domonique and members of the UK team again on any new LA visits. The LA team would like to welcome Johnny aboard as our newest assistant. Johnny recently received his stylist license and our senior team have been so impressed with how quickly he has picked up our trademarked techniques. A Paul Mitchell graduate, Johnny has fun doing lots of unique styles. He cannot wait to style every clients hair here. In his free time, Johnny enjoys dancing and travelling. He is also an aspiring actor. Please stop by and give Johnny a big LE hello when you come in for your next appointment. Micky would like to let all of our clients know that Lucinda Ellery New York City is right around the corner. She, Lucinda, and Chris enjoyed their recent trip to the Big Apple. After searching through the city high and low, a perfect location was finally selected. It has a modern urban vibe with lots of natural light and city character. 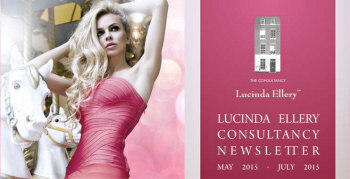 Lucinda cannot wait to make our big launch announcement, watch this space. The first step would be to arrange a complimentary consultation. We can see you before your chemotherapy treatment begins, during your treatment or once your treatment has finished. It is important to note that we can help you manage your hair loss whenever the time is right for you. Many clients choose to have the Intralace System at the early stages of treatm ent to avoid both themselves and their loved ones having to see their Hair loss. The integrated Intralace system can be used once the client has experienced 30 to 40% hair loss and can be used successfully with up to 90% hair loss. WILL THE COLD CAP PREVENT ME FROM LOSING ALL OF MY HAIR? Whilst the cold cap is not effective for everyone some of our clients have chosen to use it during their Chemotherapy which can prevent total hair loss and therefore we can successfully integr ate the system with their own natural hair even if there is up to 90% hair loss. The Cold Cap can be placed over the Intralace system. Some clients choose not to use the cold cap treatment or are advised that this treatment is not effective with their particular chemotherapy and they may experience total hair loss, however this does not prevent them from having the Intralace System. We can initially integrate the system during the early stages of hair loss and this system can then be converted to the Intralace Freewear system if total hair loss is experienced. The Intralace Freewear system is suitable for our clients that experience total hair loss. It is secured to the scalp using a medical grade tape during the weeks of total hair loss. Whilst using the Freewear system you will be able to wash and brush your hair like it was your own, even go swimming, and this system can be used 24/7. However the tapes will require changing a few times a week. Once the client's hair regrowth has reached 2.5cm in length the freewear system can then be adapted to the Intralace system and be fully integrated safely with the regrowing hair. 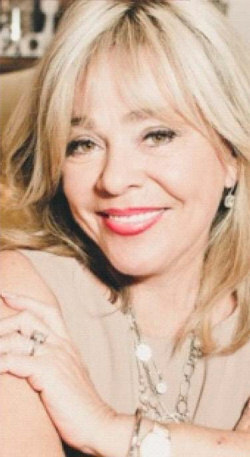 Sky presenter Jacquie Beltrao came to us when she underwent chemotherapy treatment. The Intralace System (integrated with clients own hair) and its sister product the Intralace Freewear System (suitable for total hair loss) are hair loss prosthetics that are created using a hypoallergenic material mesh. The Intralace system can be integrated with the clients hair strand by strand, even if there is up to 90% hair loss by using an intricate plaiting technique and real hair is then placed on to the mesh including a very natural looking hair parting made of silk. The Intralace Freewear system can be used if the client experiences total hair loss and is created in the same way however it is secured to the scalp using a medical grade tape. Clients can wash, brush and care for their hair just like it was their own and both systems can be used 24/7. Unlike a wig, you will be able to swim and take part in everyday activities including sports that are often not possible when using a wig. Many clients have undergone chemotherapy and avoided the trauma of chronic hair thinning or total hair loss by using the Intralace Systems. The Intralace System or The Intralace Freewear system will not inhibit any regrowth at any stage during use. When the system is integrated with your own hair you will need to return to us for maintenance appointments so that we can ensure the system is kept secure and also monitor any changes in your hair. Typically our clients will use the Intralace System for 8 to 12 months, subject to the client being happy to have a naturally short hair style, or some clients choose to wait until their hair is long enough to use our ultra fine medi connection hair extensions which will allow them to extend their regrown hair to a shoulder length hair style or longer. The Intralace System or The Intralace Freewear system will not inhibit any regrowth at any stage during use. When the system is integrated with your own hair you will need to return to us for maintenance appointments so that we can ensure the system is kept Secure and also monitor any changes in your hair. 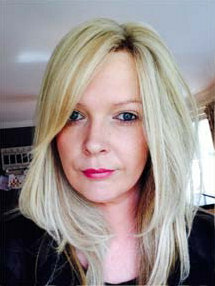 Typically our clients will use the Intralace System for 8 to 12 months, subject to the client being happy to have a naturally short hair style, or some clients choose to wait until their hair is long enough to use our ultra fine medi connection hair extensions which will allow them to extend their regrown hair to a shoulder length hair style or longer.